BAE Systems has secured a potential 30-month, $67 million contract modification to install its Radio Frequency Countermeasure platform aboard the U.S. Special Operations Command‘s fleet of MC-130J Commando II and AC-130J Ghostrider aircraft. The contract also covers systems integration services and was awarded following a technology demonstration and system design phase, BAE said Wednesday. 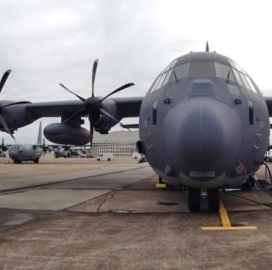 The BAE-built RFCM system works to help C-130s detect and counter aerial and surface threats as well as allow the Special Operation Forces perform close air support, aerial refueling and interdiction missions in operational environments. Brian Walters, vice president and general manager of electronic combat solutions at BAE, said the contract award seeks to reflect the company’s capability to equip large fixed-wing aircraft with electronic warfare systems. The contract’s ceiling value could exceed $300 million if SOCOM exercises all options. BAE and Northrop Grumman (NYSE: NOC) developed RF countermeasure systems for the C-130J aircraft under separate contracts awarded in January 2016.